I just finished my first batch of kombucha with the help of Sproutmaster. My scoby, heat pad, black tea, pH strips and hydrogen peroxide all arrived in super fast time, barely 24 hours after I placed my order. Very detailed instructions came with the scoby to insure success and for the odd question I had beyond the written page the ladies were there to help me! Who knew fermentation was so much fun? I highly recommend their products and service. Thank you. Your service and your sprouts are amazing! Brassica blend. Thanks so much for your quick replies, Susan! Lovely to deal with a company that is so on the ball!! I received my package yesterday and was amazed at the energy coming from the box! The Tachyon discs are truly amazing; I love that 4 inch disc! I put my food and water on it and feel that same energy going into my body! Very excited about the Tachyon products and will definitely be ordering more as soon as I can! Take care; thank you for all your kindness! Much gratitude and appreciation and many blessings. A quick email to say “thank you very much” for the great service. I received my order in less than 24 hours of placing the order. Totally awesome. The organic black seeds I ordered are great. Really spicy and fresh, beyond my expectation. I had run out of the golden berries and was missing them so it was great to get them back in stock here so quickly. Have a great day, and again thanks. I like using pea shoots in my classroom! Thank you Susan and Sprout Master what a wonderful wonderful company you have! My order came so carefully wrapped and boxed with everything and every detail and instruction I was so very happy and thank you so much for the samples as well! I'm definitely ordering more items next week so excited I found you! I had to send you this email to thank you for your attention to detail. I am a new customer and am very appreciative of both the information, and the dropper/gloves included with my hydrogen peroxide purchase. I also wanted to say how much I appreciate the quality of the sprouting trays. The gift of the paleo granola was a very nice touch and the smell of the Scent of Samadhi sample is beyond description. I will certainly be a repeat customer. Just wanting to inform you that I have tried the Siddha Bliss and love it, I will be ordering more when supply runs out. Thank You so much, you guys are awesome and we will keep spreading the word about your company and your products. Hi Cathy. I just wanted to say Thank You and tell you that you have the best customer service (taking my order) and the fasted shipping EVER.....and oh yes I LOVE, LOVE, LOVE my new Kombucha Fermentation Vessel. Thanks again. I will definitely tell everyone within ear shot about your company. Thank you Susan. All of your seeds have been of really high quality, thank you! Bonjour. Wow, I'd like to tell you thank you very much for the small surprise in my order (oats hulless) It's very nice on your part. Good job. Thank you so much. The fastest delivery ever, I orderd on the 8 June got it on the 9 June. WOW, now that is fast, also well packed. I will be ordering again, for sure 10 stars and many more. Just wanted to send a quick thank you. I'm just getting on board with growing my own sprouts and I am absolutely loving my first order. Thanks again, from a very happy sprouter. I LOVE my Kombucha Keg!!!! Sure makes it much easier than using large jars! Your price was also wonderful, shipping was very quick and so appreciated! I'm also very happy with my Kefir Grains, they are really multiplying and make such wonderful Kefir. Thank you so very much! Oceans of Blessings to all of you at Sprout Master. I'm in love with the Sonoma Shampoo and Conditioner!!!! I've been using it for 2 weeks now and my hair feels wonderful & its super soft. It’s kind of late, but I would like to thank you for your shipment and the best quality. I received it on Monday. I love the coconut oil and enjoying chia seeds in my oatmeal. It is good to see that my money is spent on worthy foods. I hope you have a great day. :) P.S And thanks for the small token as well. It was awesome. Thank you very much for the gifts that you included, that dark chocolate with the orange peel is addictive!! And the soap smells amazing :-) Such an awesome company to deal with! Picked up order this morning with no problems. You run a terrific business and I will be ordering all my sprouting seeds and equipment from you from now on. Thanks again. This is the nicest Shampoo I have ever used. (Sonoma Shampoo -Citrus Medley) My hair is so full of life now. Shinny and Fluffy. Its the best. I could never go back to the boring old store shampoos. I feel it has even cut down on my grays being crazy and wirey. Thank you for a great product and the fast shipping that your company has. I just started up my Freshlife Miracle Sprouter because I am having serious garden withdrawals. How wonderful that after almost 20 years I can still use this product. I look forward to exploring the wonderful micro green products you have available as I set out to expand my live food needs. I think your chocolate is of excellent quality and I hope you do well. I think however, that you would have more success with more attractive packaging. Unfortunately it does make an impression on consumers. I didn't expect the chocolate to be nearly as good as it was. I'm referring to the 70% dark. Good stuff. This product is awesome! High quality and a great value! Very pleased with it so far. Recently I was shopping online for food grade 35% H2O2 and was having a hard time finding a Canadian retailer who had fairly priced products. I randomly came across Sprout Master in one of my searches and decided to take a chance on them. I'm sure glad I did! The product was very well packaged. They even included a pair of disposable gloves for handling in case of leakage. I really appreciated that :) it was a nice touch and reflected their great customer service. Nice to see a company who actually cares about their clients! The shipping was super quick and the product itself is exactly as described. I am extremely pleased with my purchase and also the communication I received from Spout Master. I will definitely be doing business with them again. Highly recommended!!!!! Thank you again for your great product and wonderful customer service. I just couldn't take seeing my kids eyes blood red and stinking of poisonous chlorine after swimming anymore. After some research, I found an amazing and healthy solution: 35% Food Grade Hydrogen Peroxide. Completely natural and it actually oxygenates the body, so it's great for your health! If you research it, you'll discover oxygen kills cancer and most every other pathogen, it's an all over body health regime! Now instead of swimming in a horrid chemical that causes cancer, we're swimming in peroxide that has been proven to kill cancer. Imagine, swimming is now something that is healthy for our family, rather than poisonous. What a difference. No more red, stinging eyes, no more being coated in poison, no more guilty feeling daddy! I moved away from Canada to the Caribbean, however I still buy and have shipped down all of my H202 from Sprout Master. Their product is absolutely top notch and I have found no one that can beat their fair price...and what a bunch of friendly, happy folks to boot! Check it out! I made the mistake of not ordering quick enough and ran out, just take a look at my "before" pic. Now take a look at the "after". 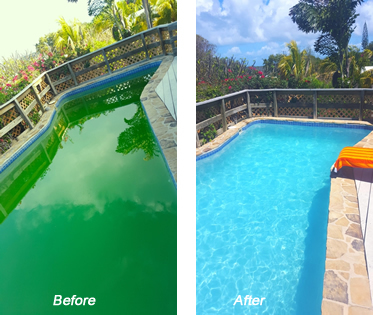 Yep, that's only Sprout Master H202 that made that green pond a sparkling blue oasis. (and a little baking soda to increase the PH). I could write all day, but I'm gunna go jump in our healthy, sparkling pool with the family! Thanks Sprout Master! You got a customer for life! They say that 1 out of 4 Canadians will develop Cancer within their lifetime. I have lost more than that! In 1984 my Mom was diagnosed with Multiple Myeloma. When the doctors told her she had between 2 to 3 weeks to live, she decided that was just wrong and that she would dance at my wedding. I got married 4 years later and I not only danced with my Mom, she got to know her granddaughters. We lost ...her in 1995 and a couple of months later, her brother died of Cancer. In 1997 my sister was diagnosed with Ewing Sarcoma, which later became Leukemia, she died in 2001. During Maries treatment, my wife's Mom was diagnosed with Breast Cancer and we lost her in 2002. 1 in 4 odds don't sound too bad, right!! I guess that depends on where you are standing. They don't sound very good from here! If you have people that care about you, then you need to do everything possible to be around for them. Get checked out before it becomes another story like this one. If you are going through this at the moment, please pay close attention to your daily attitude, try to be happy as much possible. Attitude means everything!! Attitude is what gave my Mom 11 years instead of a few weeks. My sister, Marie, was my only sibling. When she was diagnosed with cancer, she kept a brave face and soldiered on, as they say. When the initial cancer was killed by chemotherapy, we thought that she had it made. About a year later Marie called me with the news. She had absolutely no bone marrow left and needed me to be checked as a possible match for a bone marrow transplant. Of course, I gladly volunteered to be tested and the good news came about a week later - we were a perfect 6 out of 6 match…Wow! You can’t get better than that, right? I was a valid candidate for transplant! Despite everything she went through with her illness, Marie remained a very talented artist. During her chemo and bone marrow transplant she worked on a piece that she named, “The Painting”. She told me that she really couldn’t put a name to it - it just was! The painting contained her hopes, her personal thoughts, and some things that she saw everyday while sitting in Princess Margaret Hospital for treatment, looking out the window and thinking about life, death and everything in between. Marie wanted to be able to help people through their struggles somehow. She wanted people to have hope, even when it seemed like that was just a foolish dream. 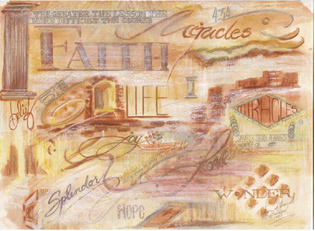 Hope is one of the words on her painting. It is there for many reasons - without hope we have very little to carry us through hard times and hope made her feel good. You see, Marie had a teacher in grade five named Miss Hope, a special teacher in that she actually liked her students, and they liked her. Marie never forgot her, even 30 years later, Miss Hope had an effect. I never had her as a teacher, but I can still see her as plain as day, singing at the piano in her classroom. That was 38 years ago for me. She was a life-force! The memory of Marie and her wish that I get her painting out to cancer patients, to help with their ‘hope’, is what still drives me, and will continue to do so. Forty-one years old is far too young for such an unfortunate illness to take her life and she is missed daily! Please pass this along to anyone who may get a moments respite from the stress of the day. The emotions that Marie painted here are as real to me today as when she was working on it. Try to make a better day for someone as often as you can.